Lush drops anchor in Nuku Hiva! After 3,400 miles, 14 days 23hours at sea we finally spotted land on the horizon. And now we’re here in French Polynesia. Wow, what an awesome trip we’ve had, pushing and sailing this boat hard to get here in good time, running a watch system, cooking, cleaning and off course… fishing!!…. The final score…. Wait for it……. Fish 9 V Boat 10!! !… only just!! Once the lads reached 10 they pulled the lines in and called it a day…… ya right…. that’s cheating, I reckon!! They didn’t want to take a chance that they could lose out to the fish after taking the lead! Sly or what! I’ll be doing up a full on rulebook for the next leg, that’s for sure. This Pacific crossing certainly was a great adventure and the amazing thing is there’s still so much more to this ocean. We were welcomed by stunning landscapes and massive knife-edge cliffs on the island of Nuku Hiva, in the Marquesas, one of the five archipelagos of French Polynesia. When you initially look at a map of the pacific you just see a massive ocean and then looking closer you notice a load of tiny dots. Well, we’re on one of those dots now and will be sailing between those dots for the next 4 months till we reach Australia in August. There are roughly 20,000 islands in the Pacific, most of which are in this southwest region. Needless to say we’ll make a good stab at exploring these islands but 20,000 of them… well you’d need to be here for a whole lifetime to get around to the lot and even at that it wouldn’t be an easy task! According to the Lonely Planet ‘French Polynesia is still about as dreamy as it gets. The trees are still heavy with fruit, the mountains rise as majestically as ever and the lagoons are just as blue!’ Wow, we’re gonna have some fun sailing around here, discovering awesome anchorages and villages, meeting the islanders, getting to know their culture and geography and finally disappearing west back over the horizon! LUSH finally lands a whopper! So team LUSH has pulled together to use any means to up the score! The rules are simple, 1 point for LUSH for any fish landed and eaten! So we figured the flying fish that land on the deck were fair cop! As it stood when Audrey last posted……the score was: Fish 9 – Lush 5 !!! As I type the score line is even-stevens as we are now at 9 all!!! Fish 6 was a stunning 15Lb Dorado which Wallisimo cooked up for us and guys it tasted just stunning!!! Holy Moly it was good and defo the best tasting fish so far!!!! Fish 7 & 8 – Are 2 flying fish…now when we say 2, 1 is defo countable…fish 8 is kinda a baby flying fish at the size of a finger nail!!! However the rules are clear….the fish is landed and will be eaten by Kizzy this evening!! Whirrrrrrrrrr……..the reel is running, the line is being stripped and al is getting stressed that we are going to run out of line! First we furl the jib from the pole, then we ease the preventer and sheet the main in so it’s safe….then we reverse the engine and take LUSH down to 1.5 kts and wait!!!! We knew this was a big sucker so we implemented, “Code Whopper” which basically means transom door open and clip on and get ready to gaff em!!! Up he came and as Al used his experienced fisherman’s hand to get him closer to LUSH….what appeared was a stunning Spearfish which is a small Marlin…..now when I say small he was only 6 FOOT LONG!!!! I hooked in the gaff and lifted him on-board and we sent him on his way to Fish Heaven! Audrey has spent the last 3 hours fileting him and freezing him for the future!!! We’re now over half way to the Marquesas in French Polynesia. Yesterday the southeast trade winds fully kicked in… at long last! The weather up to then had been very changeable with a lot of rain and squalls on a couple of the nights and all sorts of cloud to admire during the day… just not the dotted cumulus ones we were promised. Don’t get too concerned for us… we have had plenty of sunshine too just in this sailing business we need wind too. St Patrick’s day was just mighty onboard. And yes we did break a few of our ocean sailing rules (you’re allowed break rules on St Patrick’s day aren’t ya?)….. well one rule in particular…… skipper allowed us a wee bit of alcohol!!….. so Dad cooked up his beloved porridge and raisins, as per usual, in the morn only this time he didn’t use milk……. Baileys cream liquor was the ingredient of choice and wow was it divine!!!! Ye’ve got to try it!! In the afternoon we all had a half pint each of the good stuff (nicely chilled), which honestly I’ve never liked before but wow was it delicious. Maybe it’s just better in the heat! Needless to say we all had a little pep in our step after that and sure there was nothing for it but a good oul ceile on the aft deck!!! We might have been 9 thousand miles from home but it certainly felt like we were on a little Irish island in the middle of the South Pacific that day! I wonder what things would have been like if the paddies made it out here before Capt Cooke?! Now, I guess ye’re wondering where we stand on the fish scoreboard front?….. well St Patrick brought us two fish on the 17th but there’s been nothing since…… which left the score at 7 – 3 to the fish…. However the lads have disputed this …… yesterday morn Al picked up a flying fish from the deck, which had landed overnight. Now this thing was smaller than a sardine! Anyhow, he fried it up and we all had a little taste. And now the guys have changed the scoreboard to 4 as they reckon the flying fish counts…. “It landed on the boat and was eaten therefore it’s a score!” they protested… so they’ve got me on a technicality… but seriously they really are getting desperate resorting to these tactics! We had our halfway party a couple of days ago, which too, was a good laugh. The fancy dress code was toga… seeing as we were changing all sheets on the boat halfway it made sense. We blasted the music from Gladiator and sat around the cockpit table eating all sorts of fancy things from the galley!! One Life folks….. deffo living it out here! Well this will be one Paddies Day to remember!!! Middle of the Pacific with a fine people and the best yacht! J Happy Paddies Day to ya! Oh and finally a 16lb Tuna!!!! J Yum Yum! Well, the first bit is certainly true, all of us onboard have dreamt of crossing this vast ocean and it fully is awesome to be finally here sailing across the largest ocean on the planet. It is more than twice the size of the Atlantic and covers practically a third of the earths surface. At 165 million sq km, it’s area is greater than all the earths landmasses combined. The deepest part extends more than 11km from the surface. That’s 3km further than Everest is high!!!!! Full on!!! We left the Galapagos 5 days ago and are on route to the Marquesas in French Polynesia. We haven’t had the amazing tradewind conditions one would expect here and Lush is sailing on average 3 knots slower than our Atlantic crossing with windspeeds between 5-12 knots. I’ve preparded meals in advance, vac packed and frozen enough for 21days at sea. Skipper was initially expecting us to do it quicker than that so lets keep the fingers crossed. All that said we’re having an awesome time onboard with the regular 4 crew along with Alans wife, Kizzy, my Dad, Joe and a good friend of ours Gordon Cuthburt. The craic is mighty with everyone enjoying our watches, grub, daily deck dances with Wallis and the fishing…….. well actually the whole fishing thing is another matter. Anyone we previously chatted to about the Pacific said ‘you’ve got to turn up armed or the fish will take you down! !’…… so we’re armed… well kinda….. if the fish didn’t keep biting our lures and lines off!!!! And… we’re keeping a scoreboard….. well I am…. the lads aren’t that impressed with it but after the Atlantic crossing I figured we’ve got to know where we are with these fish…… Currently the score stands Fish 7 (and 2 lures!) Boat 1 ☹ The lads have been debating whether their score can be improved by the fact that they did actually catch 2 massive blue marlin (of about 15 foot a piece!!) even for a split second…… sorry guys…. if we dont board it and therefore can’t cook it……. it counts as zero to us and score to the fish! 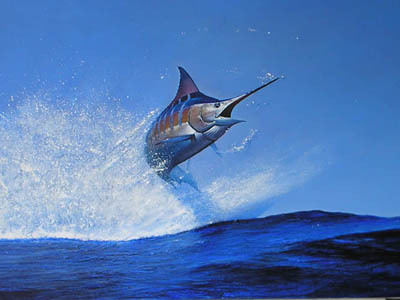 Now in fairness the marlin were massive as they jumped out of the water to spit the lure back out…. full on! As chef though I’m secretly happy they didn’t haul those things in, in fairness… they were the size of my galley!! Oh well, here’s hoping St Patrick shines on us tomorrow and the lads catch something!! Hope all brillo back home. Do have a drink for us tomorrow. We’ll certainly join in the festivities onboard the good ship Lush with 5 irish crew onboard, one half irish and one full on wannabe! Galapagos – The Islands That Changed the World! In 1831 Charles Darwin arrived in the Galapagos onboard HMS Beagle as a companion to the captain. While he was there he noticed, at first, small differences in the mocking birds between different islands. This led him to write his notebook on evolution, which he had seen at first hand in the Galapagos and believed it had taken place in all living things, including humans. This changed the worldview of life on earth and made these islands famous. Since the start of this world trip the Galapagos Islands have certainly been one of the main island groups which I looked forward to seeing the most and wow did it live up to the expectation!!!! We had the most amazing week exploring this stunning archipelago thanks to Eddie, Marie and our guide, Gustavo. We were hugely privileged to have Gustavo guide us around the Galapagos for the week and bring us to some awesome anchorages, which the majority of tourists and sailors are restricted from going. The passing sailor is only granted permission to stay in a couple of the main ports and then take local tours from there, they can’t just cruise freely between the islands like pretty much everywhere else on earth. The reason for the restrictions is due to the fact that over the years the influx of tourists has exerted huge pressure on the islands ecosystems and threatened damage to the very situation we all seek to experience. Over the course of the week we saw everything from Darwin’s’ finches, blue footed boobies, giant tortoise to frigate birds, hawks and Iguanas. We snorkeled with fur seals, sea loins, turtles, white tip reef sharks, penguins, rays and a whole heap of stunning tropical fish. One night at anchorage we had 4 massive Galapagos sharks circling the yacht!! Full on!! The most fun we had was watching the male frigate birds trying to impress the females as they passed overhead. Cooing and warbling loudly, they inflate their bright red air sacs, the size of a balloon, while vibrating their outstretched wings. Needles to say the females weren’t giving them much attention… come on lads ye have to work a bit harder than that to win any female species over!!! And the blue footed boobies.. they’re gas. they do this fancy dance, lifting their large blue feet and wings in the air to get the females attention.. if the female copies him she’s keen if not. hard luck chaps.. ye’ll have to try harder next time! In a few sentences here I could never impress on you what an enchanted week we had among this stunning volcanic islands. It truly is a majestic place both ashore and underwater. A place of unparalleled surprises, both for the mind and the senses and memories of which we will all cherish forever more. And with this in mind the following quote is very apt..
PS We crossed the equator on the way to the Galapagos and did all the various challenges to gain our rite of passage and become true ‘shellbacks’ according to traditions. We’ve posted some of the pics etc on our facebook page so do check it out if you’re keen to learn more. LUSH nearly landed a blue marlin!!!! SO here we are in the Pacific ocean after having the most amazing week in the Galapagos islands snorkelling & diving with sea lions, sharks, sting rays, penguins, countless fish and turtles! Anyhow……we left yesterday to cross the Pacific to Nuku Hiva in the Marquises Islands which is part of French Polynesia, so LUSH once more is at sea with around 3400 miles about to slip beneath her keel as we start the next leg of our amazing adventure! The sea is calm and its seriously hot! Big Daddy is a ½ foot long squid lure that was given to us by another boat in the rally! We have never caught anything on him yet and have always joked about the day we got a bite! Well, today….Al and I were chatting when the big reel started to run…….now when I say run….I mean RUN!!!!! Holy Moly or words very similar to that effect were shouted by myself and Al as the line was stripped off the reel……I slowed the LUSH down whilst Alan tried to control the line!!! I thought….I need the camera and went below and when appearing on deck I saw an absolutely MASSIVE BLUE MARLIN jump 4 feet out of the water with Big Daddy in his mouth just behind LUSH!!! I instantly thought, “how are we gonna land this thing!” We reckon he was 8 foot long and trust me he was just massive! That is so true as after this we have seen a pod of 50 dolphins feeding and leaping out of the water and a pod of pilot whales next to LUSH!